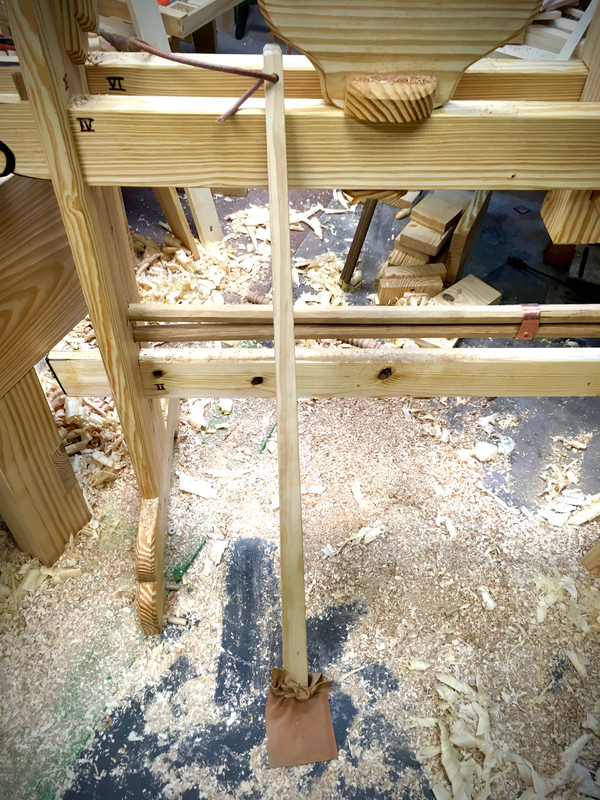 This will be a first in a series of ongoing post as I learn to use the spring pole lathe. These posts will be mostly for my own journaling purposes, but it may prove useful to others as well. When I finally made the decision to build a lathe, I agonized over which design to build. I knew that I wanted a human-powered version though. So the first major decision was spring pole or treadle? 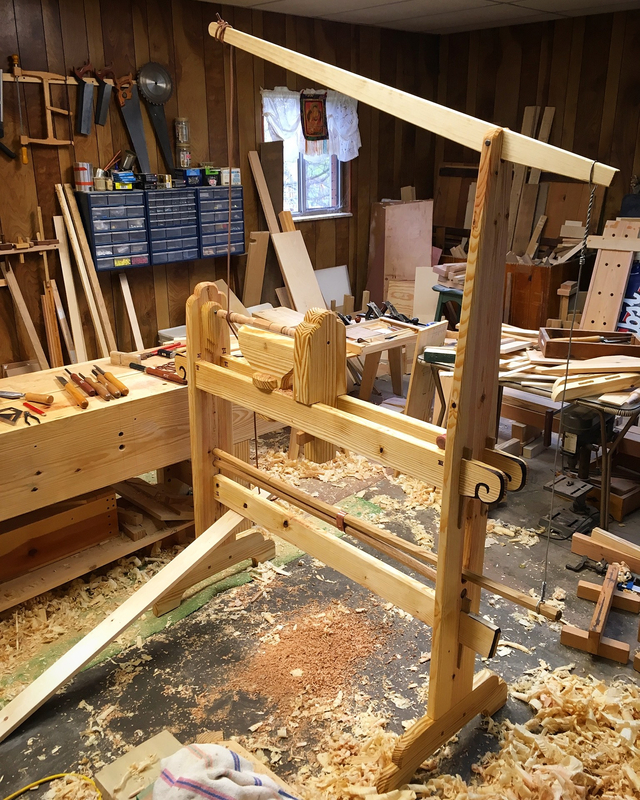 Ultimately I chose to build Roy Underhill’s version of a German double spring pole lathe due to its portability, simplicity of construction and the fact that it is a self-contained unit. My build process of a modified version of Underhill’s original is covered in a five-part series beginning here. Since Underhill still derives income (books, magazine articles, classes) and, as to my knowledge, has not made these plans free to the public, the series is just an overview of my build experience. In short, I built a lathe. Now I have to learn to use the thing. Especially daunting since I have never used a lathe of any kind, human or electric powered. Well, there was an attempt at building a lathe about twenty years ago that involved pallet wood, a garage door spring and, very nearly, severe property damage from launching said garage door spring when the cord broke. Anyway, with this design of lathe I had a couple of concerns, the pivot arm and the loose foot board. In every video I have watched of this style lathe in action the pivot arm looks to swing dangerously close the operators head. It also looked like it may pose as a constant distraction in my peripheral vision. I’m happy to report that neither concern was warranted. When using the lathe I am blissfully unaware of the pivot arm. Nor have I whacked myself in the head with it. The loose foot/treadle board proved to be somewhat more problematic. My findings don’t seem to be unique in this regard. There are several folks who seem to have had the same experience and many creative solutions can be found on the internet. The majority of which add a good bit of weight and are bulky. Ultimately sacrificing a degree of portability and versatility. The problem is keeping the thing in place during use. In use you place your stationary foot at the pivoting end of the foot/treadle board and pump away with your other foot. What I found is that the thing tends to walk away during use unless you have the perfect angle of push with your other foot. I found it quite frustrating to chase the thing around. I needed a simple way of keeping it in place. Another issue was that the return was a bit sluggish no matter the tension on the springs. This told me that the foot/treadle board was simply too heavy (see photo above). Ultimately my solution ended up being quite simple. The treadle/foot board was trimmed to a triangular shape. This made it much lighter, but still stiff enough to do its job. To keep the thing from wandering around in use, I drilled a hole and tied a scrap of leather to the pivot end. 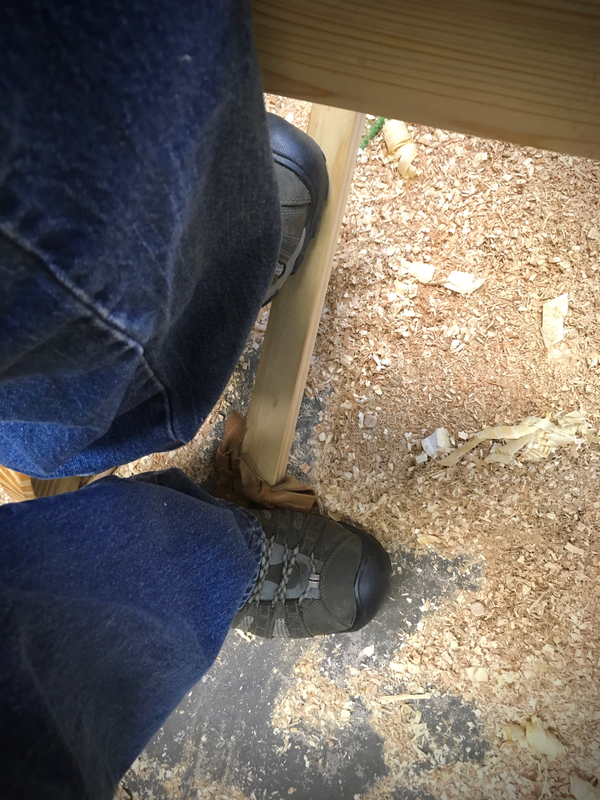 In use, I can place my stationary foot on the leather and pin the foot/treadle board in place while still maintaining the ability to swing the end of the foot/treadle board left or right. This allows me to adjust where the drive cord is riding on the workpiece as well as preserve the lathes portability. Now I can concentrate on learning to turn. This entry was posted in 5-Tools, Spring Pole Lathe, Thoughts-Views and tagged lathe, Spring Pole Lathe, wood turning. Bookmark the permalink. Weight is crucial as you have discovered, may I suggest you place some sand bags on the feet I think that will hold it down quite nicely. The lathe is fine. Although it will scoot if placed directly on the polished concrete floor. My issue was with the treadle board only. Your suggestion is a good one though. Sandbags would make the whole assembly quite stable. My assembly table I used sometimes for boards I couldn’t fit on crappy bench for planing. It would skate all over the place as my floor is tiled and tiles are smooth, so I placed sand bags around the legs and that did the trick till I got sick of tripping over them. Great idea with the leather acting like sort of a hinge. Thanks Jonas. Simple is in my wheelhouse. Like I commented to Salko above. The lathe was not the problem, just the foot/treadle board. It is not connected to the lathe except by the drive cord. So it was what was giving my trouble. Your idea is a good one though and I thing it would work. ups, I missed that part. “Since Underhill still derives income (books, magazine articles, classes) and, as to my knowledge, has not made these plans free to the public, the series is just an overview of my build experience.” – Good call on your part. Much as I would love to see more details of the build, I understand totally. Keep up the learnin’ and keep us posted. It is always tricky when building and writing about someone else’s design. One drawback to the internet is that it is far too easy to trample on intellectual property rights. I much prefer to deal with my own designs, but that is not always possible. I try to tread lightly with others, especially when I haven’t spoken with them directly. I too made a pole lathe recently but made a design that clamps onto my bench. I also encountered the problem you had with the treadle, it angling and scooting all over the place. In the end I made another board which attached to the treadle with a hinge, I then put my other foot on that board. Seeing your solution though makes me feel like I over engineered! Lovely looking lathe. Thanks! Both solutions work and your option seems to be the most common. I try to find the simplest solution I can to a problem. Sometimes I get lucky. The little scrap of leather is holding up well and doing its job.